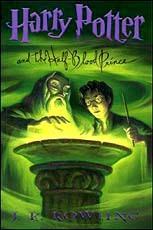 I’ve finished reading Harry Potter and the Half Blood Prince some time ago. Like all Harry potter fans I couldn’t wait to get my hands on it and was ecstatic when I did as the book wasn’t available in Syria. The sixth installment of the Harry Potter series was as enchanting as the previous five books. J.K Rowling’s creative use of imagery and descriptions made me feel like I was actually there with Harry and the other characters. The book was much darker than the previous ones and we got an idea of the things that made Lord Voldemort what he is. We also witnessed the emotional growth of Harry and his friends as they face different life challenges in their sixth year at Hogwart, some of which were extremely entertaining (Such as the Ron-Lavender fling and Harry’s jealousy of Dean Thomas, Ginny’s boyfriend). Although the book was a bit slow at the beginning the events soon escalated till the action ended with a bang with the death of Albus Dumbledore (I still cry my eyes out whenever I read that part) And this brings us to the question, did Snape really kill Dumbledore with cold blood? I think not. Snape was probably acting upon the instructions of Dumbledore and must have made him an unbreakable vow to do it. And this raises another question, is Dumbledore really dead? Some like to believe that he isn’t but I think that he did pass away as he was seen snoozing in his portrait at his office along with all of Hogwarts deceased headmasters. The book ends with us readers pondering and thinking who might R.A.B be. Regulus Black, Sirius brother seems like a likely candidate, but I wouldn’t think J.K would give it to us so easily. I guess we just have to wait for Book 7 to find that out. From an artistic point of view, the book like all the others featured a beautiful cover and illustrations by the talented Marie GrandPre. Overall the book was a great read and I highly recommend it. In case you haven’t read the book yet, here’s the plot summary, but I warn you it’s a major spoiler so if you want to read the book, do not read the following. Voldemort and his allies begin to act openly, causing widespread chaos and paranoia in Britain. Rufus Scrimgeour has replaced Cornelius Fudge as Minister of Magic after a public outcry following Fudge's mishandling of the early stages of Voldemort's attack on the wizarding world. Severus Snape makes an Unbreakable Vow to Draco Malfoy's mother Narcissa that he will protect Draco and aid him in his first, unspecified, mission as a Death Eater. Security measures have been increased at Hogwarts. Snape is given his coveted Defence Against the Dark Arts post while Albus Dumbledore and Harry Potter persuade Horace Slughorn to return from retirement to replace Snape as Potions teacher. Slughorn lends Harry an old textbook marked as the property of the "Half-Blood Prince". Its handwritten notes help Harry to outdo even Hermione in Potions. Using his Pensieve, Dumbledore shows Harry a number of memories throwing light on Voldemort's past. Dumbledore theorises that Voldemort has split his own soul into seven parts, storing six of the pieces in Horcruxes: magical objects which grant immortality as long as they exist. While two of Voldemort's Horcruxes have already been destroyed (Tom Riddle's diary by Harry[HP2] and Marvolo Gaunt's ring by Dumbledore), Dumbledore believes that there are four more that must be destroyed. He and Harry set off to retrieve one (Salazar Slytherin's locket), but Dumbledore is heavily weakened by drinking the potion guarding it. The two return to find the Dark Mark over Hogwarts and Death Eaters attacking students and staff. As they investigate, they are surprised by Draco. Dumbledore paralyse Harry, who is invisibly cloaked. Harry witnesses all the events that follow but remains invisible to all the protagonists. Draco reveals that he let the Death Eaters into Hogwarts via a magical cabinet. Other Death Eaters soon arrive and urge Draco to fulfil his mission, but he hesitates. Snape arrives and kills Dumbledore with the Avada Kedavra, fulfilling his vow to Draco's mother. Harry pursues Snape, who identifies himself as the Half-Blood Prince before fleeing Hogwarts. Minerva McGonagall becomes the interim headmistress of Hogwarts, but she and the other teachers fear that the school may have to be closed down. Harry discovers that the locket he and Dumbledore recovered is a fake. The actual locket was taken by a mysterious "R.A.B.". After Dumbledore's funeral, Harry decides not to return to school so that he can devote his time to destroying the remaining Horcruxes and defeating Voldemort. I can tell you are a english lit grad from that deep analysis of yours..
this is the third time I read the book in a row and is till make thoeries about Snape and Dumbledore..I don't know if you read fiction stories but I read a fiew and it seems that some of them were true in some aspects..
book 7 can`t come soon enough..and it seems that we will have to wait like two years to get it..
R.A.B can't be that obvious..there is a theory that it is indeed Sirius's brother and the locket they found in the headquarters when they were cleaning has some secret..
lots and lots of theories..and believe me.I can go on and on about Harry Potter.. maybe another time. Nisreen: As I wrote this post I was actually wondering what would you think about it:) The Tony Blair image made me laugh! i'm a great fan off the potter storyes, and its the only book i'v ever enjoyed reading. I just want to point out, that emptyness THE END of the whole story maybe could be.